*Disclosure: We were sent free products from Kaleidograph for review. All opinions are my own. 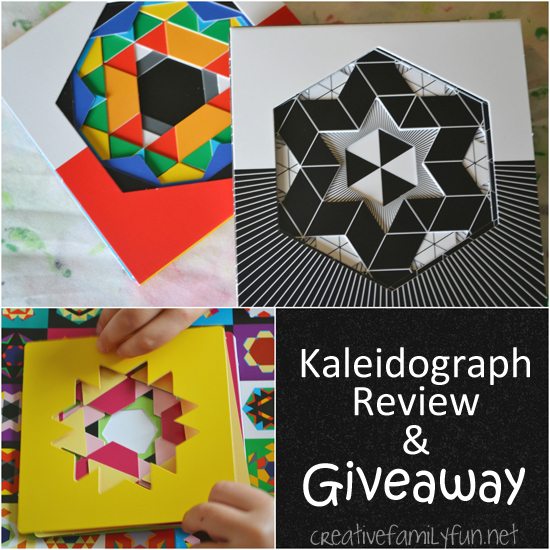 We recently got to review a fun, new product, Kaleidograph. The girls love it and I love it. 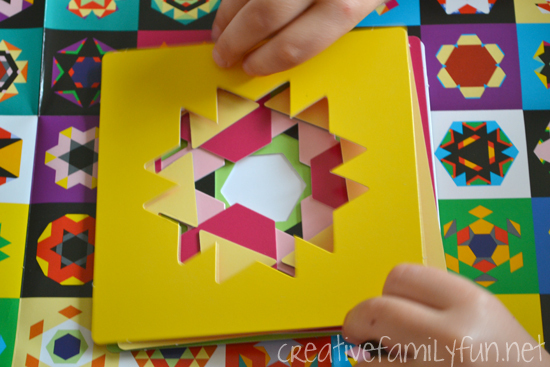 So *ahem* let me pull myself away from this awesome pattern design toy and tell you a little about it. 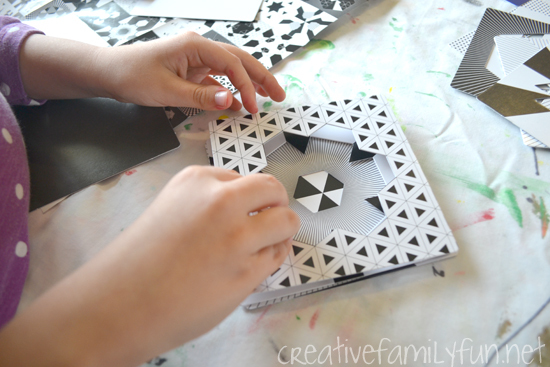 Kaleidograph is a simple toy inspired by the design toys from the original Froebel Kindergarten system. Each set contains several sturdy, double-sided, die-cut cards that fit in a sleeve about the size of a thick cd case. Each also comes with a double-sided poster showing some of the many possible combinations. Turn them, twist them, and stack them. The possibilities are endless. Seriously. I don’t think you would ever run out of combinations. My girls loved coming up with their own designs. I tried to challenge myself to duplicate some of the designs on the poster. They’re so much fun to play with at home. It’s perfect for quiet time before bed or a rainy afternoon. It would also be the perfect toy to slip in your purse for those times when you’re waiting in a restaurant or a doctor’s office. I love Kaleidograph because it’s completely open-ended. You can try to create the designs on the poster, or you can come up with your own. You can see from the picture below that my daughter was going for side-by-side designs. She tried to see how many she could make with one set. Stack as many cards as possible together or see what you can do with only two cards. Believe me when I tell you, you will love playing with this as much as your kids. Click here to find out where to buy your own set. 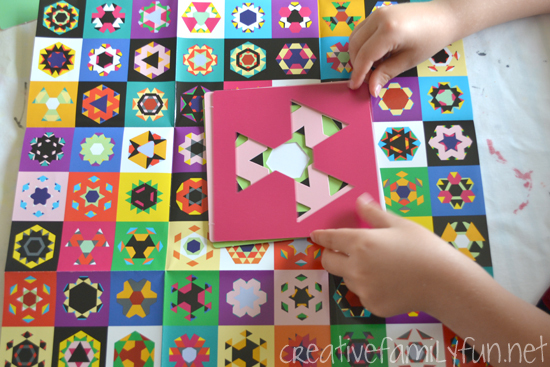 Now that you’ve seen just how awesome Kaleidograph is, would you like your own set? 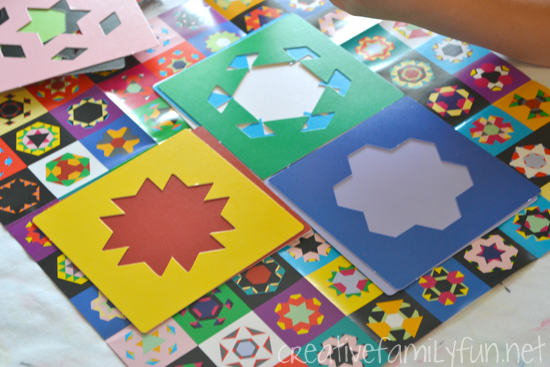 Kaleidograph and Red Hen Books and Toys are offering two winners their choice of a Kaleidograph set. That’s right, two of you will get to stay up playing all night long just like I do! (Kidding, I don’t stay up all night long playing, but I do love making designs with these) You can use the form below to enter (USA only). Only one entry is mandatory and it’s easy. Just tell me which set you would choose if you win. Your choices are Contrast, Flora, OpArt, and Crystal. (You can see all the sets here.) All other entries are completely optional!